Unless you feel confident that the index contains companies with long-term growth potential, it might not be the best place to invest, say Mark Arnold and Jason Orthman from Hyperion Asset Management. The world is changing, and “old world companies” sitting in current indices may not be those best placed to outperform. We may disagree on which tech businesses will prevail, but we would all agree that advances in technology have revolutionised our world. Many traditional large-scale companies are now scrambling to compete. At the same time, legacy businesses will need to address the declining demand from highly-geared middle-income earners facing the troubling reality that their jobs and career paths may no longer be as secure as they were. And the ability of governments and central banks to stimulate demand through either fiscal and/or monetary policy has been severely curtailed. High government debt and the aggressive quantitative easing programs have left official interest rates at historical lows and central banks with fewer arrows in their quiver. It all adds up to a future where the combination of technological change and persistent low-growth could see many traditional large-scale businesses lose essentially all long-term intrinsic value. Equity indices comprise a collection of listed businesses, typically weighted by their market value, and adjusted for liquidity. And most broad-based equity indices are made up of old world industrial businesses – highly-geared companies including banks, commodity-based businesses, capital intensive businesses and speculative stocks. For many of these businesses, particularly in Australia, the long-term return on capital and the outlook for organic revenue growth is modest at best. This means the indices which contain them are likely to underperform, for several reasons. 1. Investment returns achieved by the index tend to be primarily a function of growth in earnings and dividends per share for the largest and most liquid companies in the index. The largest companies within an index have an outsized influence on the earnings growth and income of that index. Yet, most large companies find it difficult to increase market share, because their industry penetration is already high. As a result, they tend to be more reliant on acquisitions, cost reductions and the underlying level of economic activity for growth in their earnings. 2. Total index returns are also influenced by changes in discount rates, which the market uses to value the future income streams of the underlying businesses. Discount rates are a function of risk perceptions and interest rates. Risk perceptions relate to the uncertainty associated with future free cash flows – and interest rates influence the rate at which future cash flows are discounted back to current dollars. Interest rates soared in the decades prior to the 1980s in response to higher inflation. Conversely, interest rates then reversed direction and trended lower. 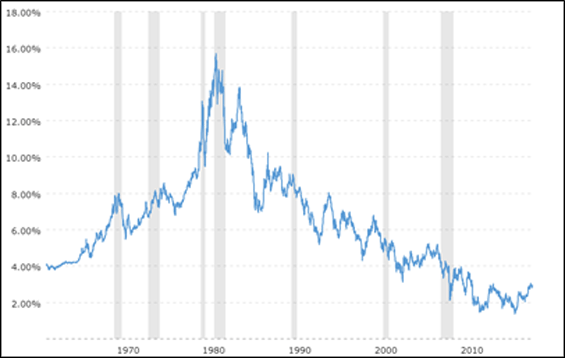 The increase in interest rates and the flow-on effect in terms of higher risk perceptions that occurred in the 1970s resulted in poor equity index returns during that period. On the other hand, the fall in interest rates following the 1980-1982 US recession was a multi-decade tailwind for global stock markets. However, few of these stimulatory mechanisms will continue. The US Federal Reserve has begun increasing official interest rates, and while rates and inflation are likely to remain lower for longer in the long term, which is good news for markets, the multi-decade tailwind of material declines in interest rates will not, and that’s bad news. The result is that equity market index returns will rely more heavily on earnings growth and dividends to produce future total real returns. The Australian stock market has the advantage of a relatively large economy; a stable democratic political system with a rule of law; an independent judiciary; a high standard of living for most of the population; a relatively large middle class; and below average levels of corruption. On the other hand, major equity indices are dominated by a few sectors – namely materials and energy businesses, and heavily geared financials reliant for growth on an already highly indebted household sector, and a structurally challenged old-world business sector. The larger stocks in the index are mature, with low forecast earnings growth rates, and low levels of technological innovation, and research and development. It was once enough to buy and hold duopolies such as Woolworths and Coles in the domestic market. However, globalisation and growing competition has reduced growth rates and returns on capital. For example, in the grocery market, Woolworths now faces intense competition from both Aldi and Costco and more global operators likely to enter the domestic market over time. The Australian market also lacks meaningful exposure to secular trends such as the shift to e-commerce, cloud computing and storage, electronic payments and financial management and reporting platforms. The world continues to migrate to a winner-takes-all model which means average and below average companies will suffer from low industry demand growth and a structural decline in the relative strength of their value proposition to customers. On the other hand, the return and performance profile of a select group of quality companies will persist – mainly new-world disrupter businesses. And these businesses generally have strong, long-term growth prospects, and relatively small index weights in key equity indices. The bottom line is that the future returns of most indices will suffer more from the failure of the old-world business models than they will benefit from the structural success of disruptive modern businesses. Returns from most major indices are likely to be much lower than has been the case over the past few decades. The structural headwinds expected to impede future economic growth rates include ageing populations; high debt levels; the disappearing middle class; and increasing environmental constraints. These headwinds will impact many of the key companies that comprise the major equity indices. No investor has a crystal ball, but a focus on long-term business economics and the ability to identify high-quality companies with strong and sustainable business propositions based on innovation and disruption, are those which are likely to outperform. Mature, legacy and low-growth businesses, on the other hand, are likely to struggle, and major indices with them.